The numbness from the dentist is finally wearing off. 🙂 I had my two silver fillings (from when I was a kid) replaced today with white composite. Now one more appointment and I’m dentist-free until my 6 month check up, whoohooo~!! Afterwards I went to Kinokuniya since it’s right down the street. I got 5 letter sets, 3 mini notepads & 5 files folders. Our PoliSci class that we’re on the waiting list for got changed to Wednesday nights instead of Mondays. Now I don’t think we’re gonna take the class since that’s the night my sister goes to church, hmmmph. 1) One book to read. 2) One movie to watch. 3) One food to eat. Walhalla Pasta from Outback Steakhouse. 4) One place to go. Disneyland, hehe~ It’s the happiest place on earth (except if you go w/ boys named Manuel). 5) One life lesson to leave behind. Live life to the fullest~!! I used to collect stationaries. Cute. i’m glad you bought yourself some nice stuff after going to the dentist! such an unpleasant experience! Lots of cute stuff! 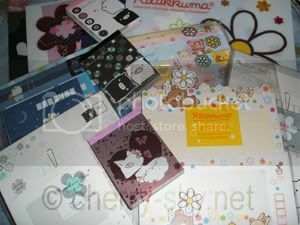 !~ The sanrio in our mall just closed down ;_____; so sad….i need to buy more stationaries asap! 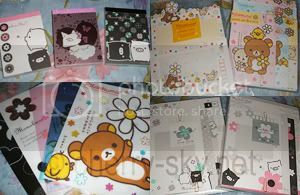 You have monokuro boo stationary! They are one of my favorite characters. My brother wants an xbox360 I’m kinda pushing him to get one because I want to play too. Awesome stationary. I love cute little things like that. I’m not much a letter writer though xD I still have two sets of stationary from like yearrssss ago.